The laboratory of Ignacio (Iñaki) Sanz, MD has been studying the precursors of antibody-producing cells in lupus. Insights could lead to new ways to control troublesome autoimmunity. Sanz, a Georgia Research Alliance Eminent Scholar, is director of the Lowance Center for Human Immunology at Emory University School of Medicine. Graphical abstract from Jenks et al, Immunity (2018). In the autoimmune disease systemic lupus erythematosus or SLE, the immune system produces antibodies against parts of the body itself. How cells that produce those antibodies escape the normal “checks and balances” has been unclear, but recent research from Emory University School of Medicine sheds light on a missing link. The results were published online Tuesday in the journal Immunity. Previous research at Emory has shown that African American women have significantly higher rates of lupus than white women. In the current study, the researchers observed that the frequency of DN2 cells was greater in African American patients. Participants in the study were recruited by Emory, University of Rochester and Johns Hopkins. Sanz, a Georgia Research Alliance Eminent Scholar, is director of the Lowance Center for Human Immunology and head of the division of rheumatology in the Department of Medicine at Emory University School of Medicine. Co-first authors are Jenks, postdoctoral fellow Kevin Cashman, PhD and Esther Zumaquero-Martinez, PhD at the University of Alabama. The lab of Frances Lund, PhD at University of Alabama, as well as postdoc Urko Marigorta, PhD from Georgia Tech contributed to the paper. The researchers examined the characteristics of DN2 cells and the patterns of genes turned on in those cells. DN2 cells appear to be precursors to the plasmablasts that produce autoreactive antibodies, which cause so much trouble for people with lupus. Plasmablasts are an important source of antibodies that help get rid of bacteria or viruses during an infection. But in lupus, subsets of B cells and plasmablasts persist in unhealthy ways. In general, we can think of plasmablasts as weapon factories, and B cells as a library of blueprints for various antibodies/weapons. Understanding where the problem plasmablasts come from can provide clues on how to target them and how to control the disease. Molecular probing showed that DN2 cells in SLE patients are hypersensitive to activation through TLR7, a pathway by which the immune system senses viral infections. This may be how they get over-expanded, Jenks says. 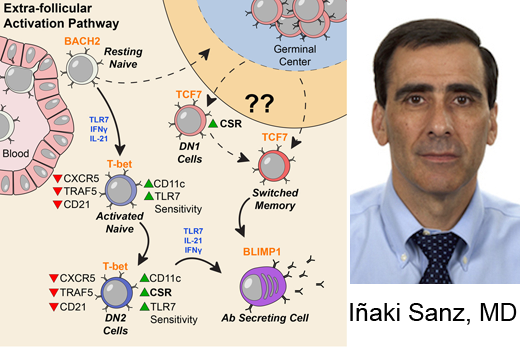 Previous work in Sanz’s lab had shown that a group of “activated naïve” B cells are precursors to the problem plasmablasts. Those cells are very similar, in their molecular markers, to DN2 cells. Jenks says the researchers are now figuring out the relationship between DN2 and activated naïve cells, as well as investigating additional intervention strategies that could specifically control those cells. The research was supported by the National Institute of Allergy and Infectious Diseases (U19AI110483, R37AI049660, P01AI125180, P01AI078907, R01AI110508, R01AI121252 and U19AI109962) and the National Institute of Arthritis and Musculoskeletal and Skin Diseases (AR043737, AR069572 -- Hopkins Lupus Cohort).